I wish you a relaxed Thursday, weekend’s coming closer! Some of my all time favorite film songs were written for James Bond movies. Let’s start with “Golden Eye”. 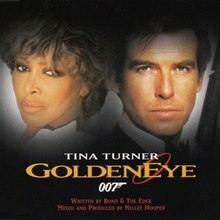 “GoldenEye” is a song performed by Tina Turner, and the eponymous theme song for the 1995 James Bond film, GoldenEye. “GoldenEye” was first released on the original motion picture soundtrack and the following year it was included on Turner’s album Wildest Dreams. The song has been covered by Nicole Scherzinger for the 2010 GoldenEye 007video game. “Skyfall” is the theme song of the 2012 James Bond film of the same name, performed by the English singer Adele. It was written by Adele and the producer Paul Epworth, and features orchestration by J. A. C. Redford. The film company Eon Productions invited the singer to work on the theme song in early 2011, a task that Adele accepted after reading the film’s script. 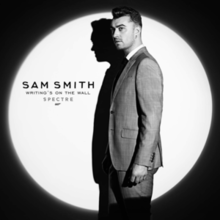 While composing the song, Adele and Epworth aimed to capture the mood and style of the other Bond themes, including dark and moody lyrics descriptive of the film’s plot. “Skyfall” was released at 0:07 BST on 5 October 2012 as part of the Global James Bond Day, celebrating the 50th anniversary of the release of Dr. No, the first James Bond film. “Skyfall” became a major commercial success. The song reached number one in 11 countries and top 5 in many more regions. It quickly went to the top of the iTuneschart, and peaked at number two in the UK and number eight in the US on the Billboard Hot 100. As of 2018, “Skyfall” has sold over 7 million copies worldwide making it one of the best-selling digital single of all-time. Critically, “Skyfall” was widely acclaimed, with the song being favourably compared to Shirley Bassey‘s Bond themes. “Skyfall” received various accolades including the Academy Award for Best Original Song, Brit Award for British Single of the Year, Critics’ Choice Movie Award Best Song, Golden Globe Award for Best Original Song and the Grammy Award for Best Song Written for Visual Media, thus making it the first Bond theme to win all the aforementioned awards. During the 85th Academy Awards, Adele performed the song live for the first time. “Live and Let Die” is the main theme song of the 1973 James Bond film Live and Let Die, written by Paul and Linda McCartney and performed by Wings. It was the most successful Bond theme to that point, charting at No. 2 on the US Billboard Hot 100 and No. 9 on the UK Singles Chart. Commissioned specifically for the movie, it reunited the former Beatle with the band’s producer, George Martin, who produced the song and arranged the orchestra. It has been covered by several bands, with the Guns N’ Rosesversion being the most popular cover. Both the McCartney and the Guns N’ Roses versions were nominated for Grammy Awards. In 2012, McCartney was awarded the Million-Air Award from Broadcast Music, Inc. (BMI), for more than 4 million performances of the song in the US. “We Have All the Time in the World” is a James Bond theme and popular song sung by Louis Armstrong. Its music was composed by John Barry and the lyrics by Hal David. It is a secondary musical theme in the 1969 Bond film On Her Majesty’s Secret Service, the title theme being the instrumental “On Her Majesty’s Secret Service,” also composed by Barry. The song title is taken from Bond’s final words in both the novel and the film, spoken after his wife’s death. Armstrong was too ill to play his trumpet. Barry chose Armstrong because he felt he could “deliver the title line with irony”. The song was released as a single in both the US and the UK to coincide with the release of the film in December 1969, but did not chart in either market. The recording became a hit in the UK twenty-five years later, in 1994, as a result of a Guinness beer commercial, after My Bloody Valentine chose to cover it for charity. Armstrong’s version was then re-released on vinyl and CD and reached #3 in the UK Singles Chart and #4 in Ireland. In 2005, a BBC survey found that it was the third most popular love song played at weddings. In addition to My Bloody Valentine, “We Have All the Time in the World” has been covered by Iggy Pop, Fun Lovin’ Criminals, Vic Damone, Michael Ball, Giorgia Todrani, The Puppini Sisters, Tindersticks, The Pale Fountains, Shirley Bassey (for a later withdrawn album of Bond themes), Thomas White and Alfie Boe. Iggy Pop’s version plays during the end credits of the film The Jacket. John Barry cited “We Have All The Time In The World” as one of his favourite Bond compositions, saying it was the finest piece of music he had written for a Bond movie; also because of the pleasure of working with Louis Armstrong. “Goldfinger” is the title song from the 1964 James Bond film Goldfinger. Composed by John Barry and with lyrics by Leslie Bricusse and Anthony Newley, the song was performed by Shirley Bassey for the film’s opening and closing title sequences, as well as the soundtrack album release. The single release of the song gave Bassey her only Billboard Hot 100 top forty hit, peaking in the Top 10 at No. 8 and No. 2 for four weeks on the Adult Contemporarychart, and in the United Kingdom the single reached No. 21. The song finished at No. 53 in AFI’s 100 Years…100 Songs survey of top tunes in American cinema. In 2008, the single was inducted into the Grammy Hall of Fame. “Diamonds Are Forever”, the title song with lyrics by Don Black, was the second Bond theme to be performed by Shirley Bassey, after “Goldfinger“. The song was also recorded in Italian by Bassey as “Una Cascata di Diamanti (Vivo Di Diamanti)”; this version was only issued on 7-inch single in Italy, and was intended to be included in a (cancelled) 3-CD box set titled Shirley released in 2012.Diamonds Are Forever is the soundtrack by John Barry for the seventh James Bond film of the same name. Producer Harry Saltzman hated the song and it only made the film due to co-producer Albert Broccoli. One of Saltzman’s major objections was to the innuendo in the lyrics. Bassey would later return for a third performance for 1979’s Moonraker. Moonraker was the third of the three Bond films for which the theme song was performed by Shirley Bassey. Frank Sinatra was considered for the vocals, before Johnny Mathis was approached and offered the opportunity. Mathis was unhappy about the song and withdrew from the project, leaving the producers scrambling for a replacement. Kate Bush declined as she was due to embark on her British tour, so John Barry offered the song to Bassey within just weeks of the release date. As a result, Bassey made the recordings with very short notice and never regarded the song ‘as her own’ as she had never had the chance to perform it or promote it first. The film uses two versions of the title theme song, a ballad version heard over the main titles, and a disco version for the end titles. Confusingly, the United Artists single release labelled the tracks on the 7″ single as “Moonraker (Main Title)” for the version used to close the film and “Moonraker (End Title)” for the track that opened the film. The song failed to make any real impact on the charts, which may partly be attributed to Bassey’s failure to promote the single, given the last minute decision and the way in which it was quickly recorded to meet the scheduleMoonraker is the soundtrack for the eleventh James Bond film of the same name. guitar colleague, a fantastic electric guitar player ..
“Writing’s on the Wall” is a song by English singer Sam Smith, written for the release of the 2015 James Bond film Spectre. The song was released as a digital download on 25 September 20The song was written by Smith and Jimmy Napes, and produced by the latter alongside Steve Fitzmaurice and Disclosure and released on 25 September 2015. “Writing’s on the Wall” received mixed reviews, especially when compared to previous Bond theme songs. The mixed reception to the song led to Shirley Bassey trending on Twitter on the day it was released. [The single became the first Bond movie theme to reach number one in the UK Singles Chart. It also reached the top 10 in a few other European countries, but unlike other James Bond themes, it was not as successful outside Europe, only peaking at number 43 in Canada and Australia and number 71 on the Billboard Hot 100. Only the instrumental version of the song appeared on the film’s official soundtrack album. The song won the Golden Globe Award for Best Original Song at the 73rd Golden Globe Awards and the Academy Award for Best Original Song at the 88th Academy Awards, making it the second-ever Bond theme to win (after “Skyfall” by Adele in 2012). I wish you a beautiful Thursday and come back tomorrow with a new story. Let you surprise!